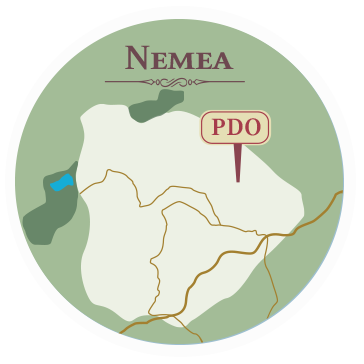 The vineyard in Nemea has a bilateral linear shape, with moderate dense planting (400-500 plants per 0,001 Km2). Lower altitudes feature mostly alluvial deposits from the river Asopus, which are more fine-grained at the center of the plain, where soils are deep and fertile, and coarser at the outskirts of mountain formations, dominated by gritty soil, with low fertility and less water potential. In the semi-mountainous area, where the soil is shallow and calcareous, Agiorgitiko matures at an early stage, benefitting from the milder climate conditions (mountainous and semi-mountainous terroirs), while maturation comes later (within the month of October) in the mountainous and colder zone, depending on the weather conditions of each harvest.